I confess that I never saw anything that appeared so much like certain death as this movement did….We moved forward in line until with a few rods of the river, when the order was given “By the right of companies-to the front double quick march!” On we marched with a badger” yell, down the bank, over the Brooklyn skirmishers to the water’s edge, plunged into the boats until we lay about three deep and pushed off. 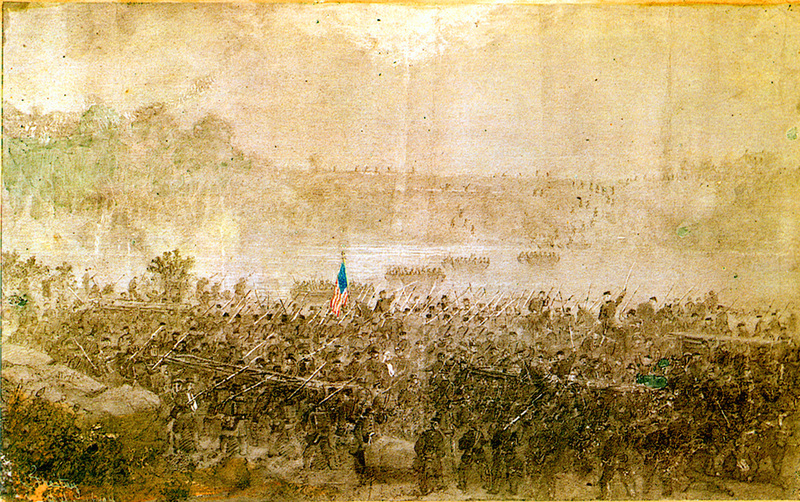 The Sixth Wisconsin crosses in boats at Fitzhugh's Crossing, May 29, 1863. Rogers Collection, Vernon County (WI) Historical Society. This was a far more deadly crossing than Sedgwick’s to the north–the Iron Brigade lost 58 men killed and wounded, thrice the number who fell at Franklin’s Crossing that day. Early’s division lost more than 100 prisoners. 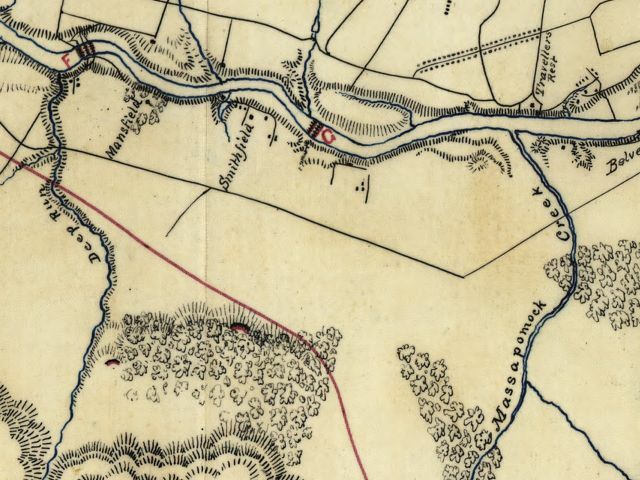 Within hours after the initial crossing, all of James Wadsworth’s division was across the river, and soon he had made connection with Sedgwick’s men, upstream to his right. 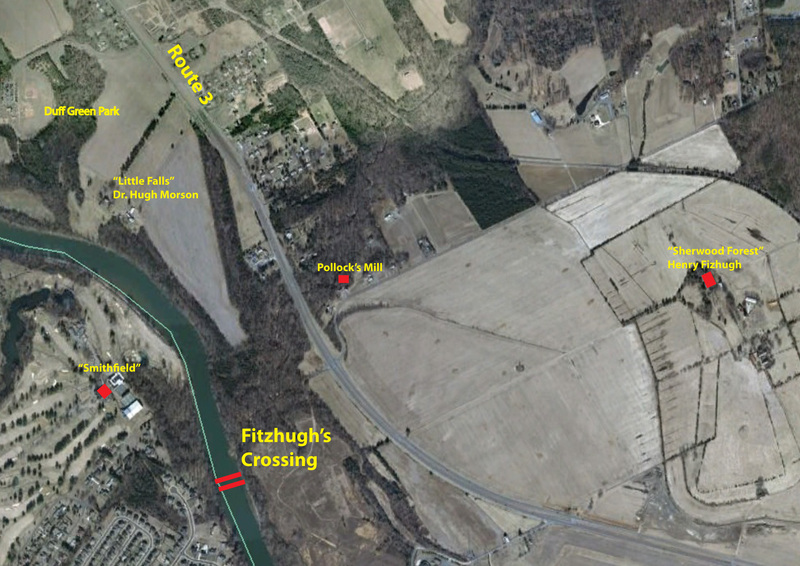 Today Fitzhugh’s Crossing is on the grounds of the Little Falls Water Treatment Plant (the terminus of the upper crossing is likewise on such a site). The southern terminus is near the River Run subdivision, just south of the Fredericksburg Country Club (with its clubhouse at “Smithfeild”). All of this land is private property and not accessible to the public. * One of the most useful internet projects undertaken related to the Civil War has been the publication online of much of the E.B. Quiner Collection of newspaper clippings that relate to the Iron Brigade. You can find it here. Did Waud produce both of the sketches? I am familiar with the top one but not the bottom one. The image is indeed in the Vernon County Historical Society’s collection. We used that image in the essay book Giants in their Tall Black Hats quite a few years ago. There is a second image showing Reynolds and staff in the collection also. I will look for it and if it has any background of use will forward a copy to the park. Really enjoy the blog! Thanks for everyone’s efforts on it. 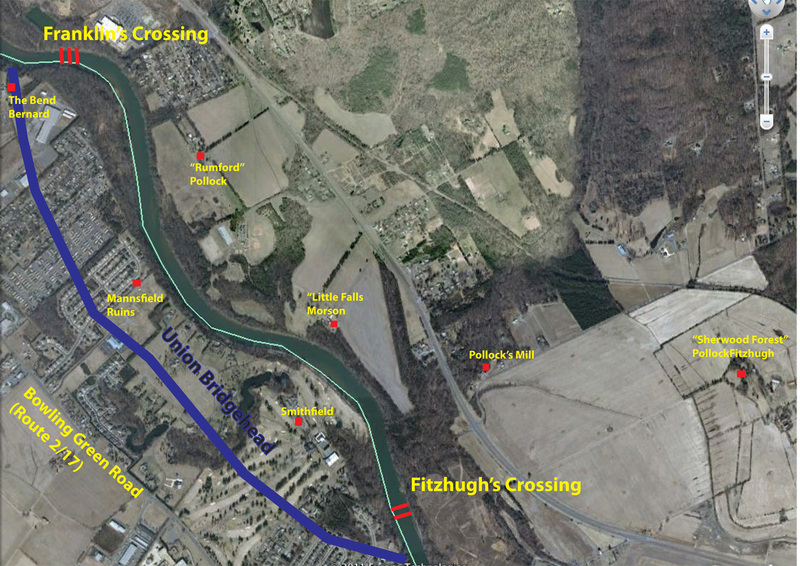 Thanks for the post, I had been confusing the Franklin’s and Fitzhugh’s crossings until the tour on Saturday. The quote I left on the previous post was apparently from this crossing, not Franklin’s. Absolutely fascinating! There is something about these river fords/crossings that really evoke the ‘war years’. On a related subject, when I recently visited the US Ford area I saw extensive remains of what appeared to be canal locks and other stone structures. Can anyone identify what they were part of? My grandfather’s home and business, the Northern Neck Hatchery, were located on Little Falls Run about where Pollock’s Mill was located. The house still stands. Just ran across a soldier buried at Fredericksburg National Cemetery, Private Alexander Allen, Co. K, 14th NY (#5587). Reported as dying at the “Fitzhue House” (Sherwood Forest) in early May ’63 after being wounded at Reynolds crossing between 28-30 Apr. Wonder if he was one of the “Brooklyn skirmishers”? Thanks for posting about the lesser-known crossing.